Tile Cross Academy in Birmingham is one of the latest education establishments to sign the Armed Forces Covenant. The covenant is a voluntary pledge from businesses and organisations to acknowledge and understand that those who serve or who have served in the Armed Forces. This includes Reservists, and their families, should be treated with fairness and respect in the communities, economy and society they serve with their lives. As part of their pledge the Academy hope to support employees who are Service leavers, and their spouses, as well as offer support to those who may want to join the Reserve Forces or become a Cadet Force Adult Volunteer. They are also hoping to raise awareness of different employment pathways for students who may want to join the Armed Forces and hold Remembrance Day services for year 7 pupils. 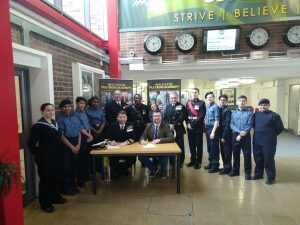 The signing took place at the Academy and was co-signed by Commander Phil Sparke, Commanding Officer of the Royal Naval Reserve detachment at HMS FORWARD in Birmingham, and Mr Paul Marano, Deputy Headteacher from Tile Cross Academy. Paul Marano, Deputy Headteacher from Tile Cross Academy commented: “I was very pleased to sign the Armed Forces Covenant on behalf of Tile Cross Academy. It formalises what is already part of our school’s ethos and values. “We are part of the Cadet Expansion Programme and Troops to Teachers Scheme. We employ veterans and celebrate Armed Forces Day. The school also uses its Roll of Honour from WW1 and WW2 as the centre piece of its annual Act of Remembrance. The school already has a thriving Combined Cadet Force unit which was established by the Government’s Cadet Expansion Programme. Their students have been able to partner with TS Stirling’s Sea Cadets in Shard End and can choose to be either Royal Naval or Royal Marines Cadets. As part of the opportunities on offer to them they have been able to join in with wider cadet activities and have even travelled to America to take part in Cadet camps and learn skiing and snowboarding skills.